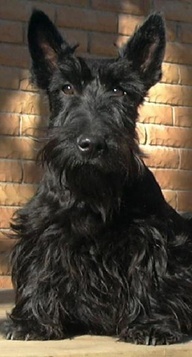 Scottish Terriers, or Scotties, are a highland breed of terrier originating in Scotland. They are known for their distinctive beards and eyebrows. 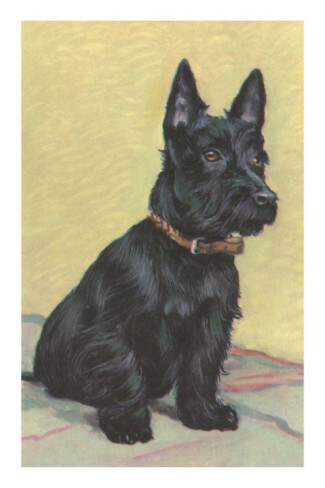 Beloved by Scottish and English royalty for centuries, the Scottie only recently made their American debut in the 1890’s. They quickly became a favorite of American presidents as well. Scotties are the only breed who have lived in the White House three times, with Presidents Roosevelt, Eisenhower, and George W. Bush. Former First Dog Barney Bush, was one of two Scotties who spent 8 years in the White House with President Bush. 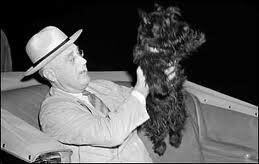 And Fala Roosevelt was so famous that he is the only pet to ever be memorialized in a statue in Washington, D.C. with his famous pet parent! Size & Weight: Scotties are small, compact dogs, standing at 10-11 inches at the shoulders, and weighing between 19-23 pounds. Coat & Color: Scotties have hard, wiry outer coats with soft, dense undercoats. Their coats can be any color except for white, although dark brown to black is most common. Scotties are small, hardy, loveable dogs with big personalities. Nicknamed “Diehard” for their endless determination, Scotties are independent and self-assured. However, this doesn’t mean that they don’t love people—Scotties are charming dogs who make loving, gentle members of the family. They have a strong desire for approval, and don’t respond well to harsh words or punishment, so it’s best to use positive reinforcement when training. Scotties have won Best in Show at the Westminster, a total of nine times, second only to the Wire Fox Terrier. Not just favorites of world leaders and world-class dog shows—recently fans of the classic Monopoly board game voted the Scottie dog game piece the most popular of the original tokens! If you’re looking for a dog that will reward your love with a lifetime of devotion, this is the dog for you! Scotties are known for becoming fiercely attached to their owners. Scotties shed little to none. Scotties make great watch dogs, family pets, and companions—the total package. Their spirited nature dictates that they require regular exercise. They should always be walked on a leash, as their chase instinct is strong. Because they were originally bred to hunt vermin, Scotties are natural-born diggers and so they should be monitored if left outdoors. Stubborness is a common trait among Scottish Terrriers so training and socialization is key – and ideally beginning at a very young age. To adopt a Scottish Terrier of your own, please visit Scottish Terrier Rescue of the Southeast for more information.